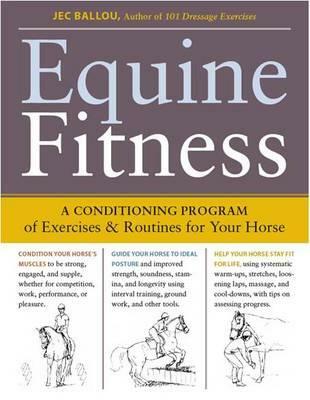 From Jec Aristotle Ballou, author of Storey's best-selling "101 Dressage Exercises", comes "Equine Fitness", a guide to getting a horse in shape and maintaining his overall fitness, regardless of age or discipline. A horse's health is a critical concern for every equestrian - from the backyard owner who wants to enjoy her mount for many years to the show rider who needs her horse to perform at consistently high levels. Conditioning will improve soundness, stamina, quality of motion, and longevity. "Equine Fitness" provides owners and riders with expert instruction for assessing, monitoring, and maintaining the health of their horses. In addition, "Equine Fitness" features individual and group exercise routines specifically designed to enhance strength and agility, geared to horses of differing ages and abilities. Clear step-by-step instructions and detailed illustrations make the information easy to follow and implement. There is even a set of handy, pocket sized cards for owners and riders to consult directly while working with their horses. Keep your horse fit, happy, and eager to please with exercise routines that are simple to follow and fun to perform. Designed to improve equine strength and agility, these exercises give every horse -- regardless of age, ability, or discipline -- the fitness training to perform at consistently high levels. Additional benefits of these routines include increased stamina, improved range of motion, and fewer injuries in your well-conditioned horse.